Zoology, or animal biology, is the field of biology that involves the study of animals. The word zoology comes from the Greek words zōion, meaning “animal”, and logos, meaning “the study of”. It encompasses all aspects of scientific knowledge about animals, like embryonic development, evolution, behavior, ecological distribution, and classification. Zoology is broken into many branches because there are so many different ways to study animals; it is also broken into branches based on which animals are being studied. People have been interested in learning about animals since ancient times. The prominent ancient Greek philosopher Aristotle took detailed notes on animal observations, and inspired other scientists for many hundreds of years. Many universities were founded in Europe in the 16th Century, and by the mid-17th Century, divisions were founded in universities that focused entirely on animal research. In the 19th Century, the microscope became commonplace in scientific research, and this opened up a whole new realm of possibility; now, the cells of animals could be studied at the microscopic level. Another breakthrough in zoology occurred when the naturalist Charles Darwin developed the theory of evolution by natural selection. This theory revolutionized zoology and taxonomy (classification). More recently, the discovery of DNA as life’s genetic material led to even more new research and knowledge about the natural world and the evolutionary relationships between animals. Zoography, also called descriptive zoology or zoogeography, is the study of animals and their habitats. It is concerned with the geographic ranges of specific populations of animals, their effects on the ecosystems they live in, and the reasons for a specific spatial distribution of an animal species. Comparative anatomy is the study of similarities and differences in the anatomy of different types of animals. Closely related animals like mammals share common bones, even if these bones have been extremely modified in shape. For example, bat wings are essentially very long, thin bones that are homologous to the ones in human fingers. Studying the similar anatomical structures in related organisms provided evidence for evolution from a common ancestor that was later confirmed by genetics research. Comparative anatomy is still used today, often in paleontology, the study of fossils. Animal physiology is the study of the bodily processes that occur in animals that allow them to maintain homeostasis and survive. Homeostasis is the ability of the body to maintain a relatively constant equilibrium even in a changing environment. One example is the regulation of body temperature in mammals. Humans have a normal body temperature of about 37°C (98.6°F), even when the environment they are in is much colder. Animal physiology involves the study of processes like temperature regulation, blood pressure and blood flow, and the release of hormones at specific times in the body. Ethology is the study of animal behavior, usually in regard to in their natural environment as opposed to in a lab. Ethology has roots in the work of Darwin, but emerged as a field in the 1930s. It involves the study of animal learning, cognition, communication, and sexuality, and is related to evolutionary biology and ecology. Principles from ethology research are also used in animal training. Behavioral ecology emerged from ethology. It is the study of evolution as the basis for animal behavior due to ecological pressures, which are constraints placed upon organisms by their environment. Organisms with traits that are well-suited to their environment have a higher likelihood of surviving and reproducing than those who do not. When the proportion of individuals with favored traits increases over a long period of time, evolution can occur. Behavioral ecologists study animals’ competition for resources such as food, territory, and mates and the increased reproductive success that certain traits may give. Mammalogy, the study of mammals. A popular type of mammalogy is primatology, the study of primates. Ornithology, the study of birds. Herpetology, the study of amphibians and reptiles. Ichthyology, the study of fish. Entomology, the study of insects. Entomology is itself broken down into many categories because there are so many types of insects. Some examples of its subcategories are Lepidopterology, the study of butterflies and moths, Myrmecology, the study of ants, and Coleopterology, the study of beetles. This is a picture of a coral reef. 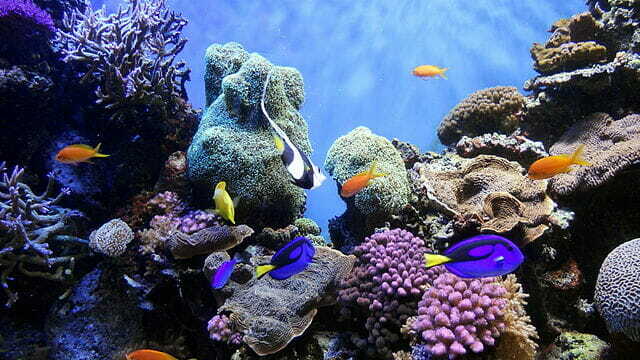 Coral reefs are full of biodiversity; many fish and other sea animals live on corals, which are also animals themselves. Many people are fascinated by animals, so zoology can be a rather competitive field. However, there are many different types of jobs in zoology. Many zoologists are researchers who study animals in lab and or/field settings. To be the head of a research lab, having a PhD is necessary. Another job in zoology is that of a wildlife rehabilitator, who cares for wild animals that are orphaned or injured in order to improve their health so that they can return to their natural habitat. Still other zoologists work in zoos as zookeepers and zoo curators, who take care of zoo animals, monitor their behavior, train them, and educate the public about the animals. Many zoologists also work in conservation, where they do research, collect information about endangered species, and educate people about these species. Entry-level jobs in zoology usually require a bachelor’s degree and some experience working with animals, while more advanced positions may require a master’s or doctorate. Some people go on to become zoologists after getting a bachelor’s degree in biology or a related field. They combine a degree in biology with animal work, and may go on to get a master’s or doctorate specifically in zoology. However, some colleges do offer bachelor’s degrees specifically in zoology. Zoology bachelor’s degree programs involve general classes in the basic sciences– biology, chemistry, physics, and math– and also involve upper-level classes on a variety of subjects, from animal science to microbiology to wildlife ecology. These classes meet the requirements for graduate studies in zoology; if someone who has not received a zoology bachelor’s degree goes on to do graduate work in zoology, they must meet several basic requirements. Usually these requirements include, in addition to biology courses, at least three semesters of chemistry, a year of physics, and a year of calculus. All of these courses are usually taken in the process of getting a bachelor’s degree in biology. If one has deficiencies, he or she may be able to make up for it by taking these courses before or while attending graduate school. n.a. (n.d.) “Branches of Zoology.” BioExplorer.net. Retrieved 2017-04-16 from http://www.bioexplorer.net/divisions_of_biology/zoology/. n.a. (n.d.) “Zoologist.” North Carolina Association for Biomedical Research. Retrieved 2017-04-16 from http://www.aboutbioscience.org/careers/zoologist. n.a. (2017). “A Brief History of Zoology.Actforlibraries.org. Retrieved 2017-04-16 from http://www.actforlibraries.org/a-brief-history-of-zoology/. Hardison, Ross C. (2003). “Comparative Genomics.” PLoS Biol. 1(2): e58. Harper, Douglas (2017). “Zoology.” Online Etymology Dictionary. Retrieved 2017-04-16 from http://www.etymonline.com/index.php?term=zoology. Kielmas, Maria (n.d.). “What Jobs Could a Zoologist Get?” The Houston Chronicle. Retrieved 2017-04-16 from http://work.chron.com/jobs-could-zoologist-get-10471.html. “Zoogeography.” Merriam-Webster.com. Retrieved 2017-04-16 from https://www.merriam-webster.com/dictionary/zoogeography. “Zoology.” Merriam-Webster.com. Retrieved 2017-04-16 from https://www.merriam-webster.com/dictionary/zoology.